Our most popular LED strip kit yet! Simple design allows for a complete installation without the need to cut, splice or solder any part of it. All quick connects, different length cables and connectors. 6 pieces of lighted strips are included and the hardware. Slim remote control with memory allows you to program as you like and leave it, or change it up all the time. ON LINE SPECIAL!- Replacement Box (white box) control for the RGB LED Kit. Use as a spare unit or replace a lost or broken piece. Works with the Brite Lites color changing LED kit only. ON LINE SPECIAL!-Replacement 20" strip for the Multi Color Remote control LED kit. Will only work with the 6 piece LED kit and remote control. Use as replacement piece or extra to expand existing kit only. 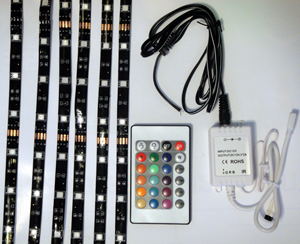 ON LINE SPECIAL!-Replacement 40" strip for the Multi Color Remote control LED kit. Will only work with the 6 piece LED kit and remote control. Use are replacement piece or extra to expand existing kit. ON LINE SPECIAL!-Replacement 8" strip for the Multi Color Remote control LED kit. Will only work with the 6 piece LED kit and remote control. Use this option to add to an existing kit or to purchase a replacement strip. strip will not function without kit. ON LINE SPECIAL!- Replacement IR remote control for the RGB LED Kit. Use as a spare unit or replace a lost or broken piece. Works with the Brite Lites color changing LED kit only. Comes new with battery.